The Cougars stayed unbeaten in a matchup of boys soccer powerhouses. 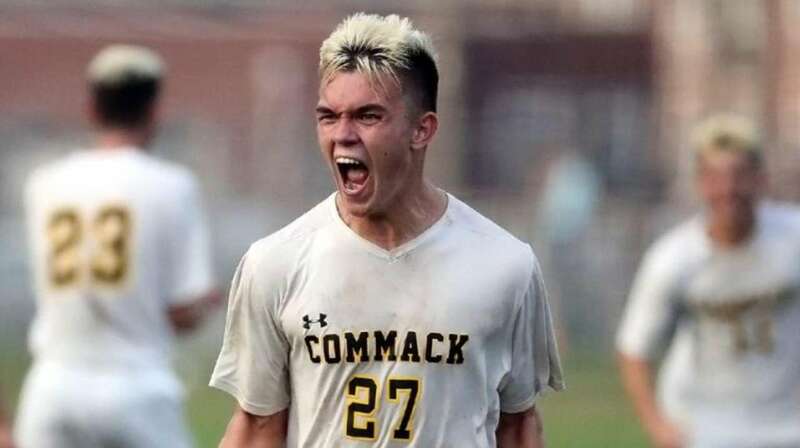 Thanks to strong play in the midfield and a pair of well-taken finishes, Commack maintained its unbeaten record and notched another win over its top league rival. Tyler Meotti and Liam Rothar scored second-half goals to lead Commack to a 2-0 win over host Brentwood in a Suffolk I boys soccer game Monday night, giving the Cougars a sweep of the season series between the two powerhouses. The battle in the midfield was the key for Commack (9-0-1), which controlled the ball for large stretches and ramped up the pressure in the second half. “They always play hard, so we just had to come out and play harder,” Rothar said. With 18:30 left, Commack finally converted its possession edge into a goal. Matt Newfield lined up for a free kick at the top of the penalty area, but instead of taking a shot he made a pass on his right to Meotti, whose right-footed shot found the back of the net. Brentwood (7-2) pushed for an equalizer, but the Cougars put the game away about seven minutes later, when Rothar found a way to score from close range after falling to the ground. Brian Mirman had three saves for Commack, which also got a strong effort up front from Matthew Cozetti, one of the top scorers in the county who attracted the attention of the Brentwood defense and created chances for his teammates.